UPrep-CLC’s foaming cleansing action prepares the surface of your floor removing oxidation, corrosion, exhaust fumes and road film, and other contaminants while leaving the surface pH neutral. 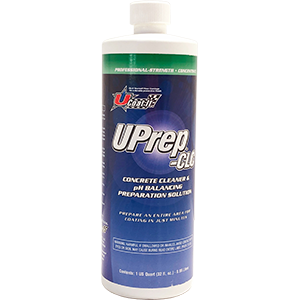 Specially formulated for cleaning and preparing bare cement surfaces for a UCoat It floor coating system, UPrep-CLC is easy to apply, easy to use, easy to remove and works effortlessly. Dilute 7:1 with water and apply to a wet surface. Agitate with a stiff-bristled brush and rinse clean. Coverage is 2 qt bottles (in dilution) for every 200-300 sq.ft. For example, for a typical 2½ car garage (576 sq.ft. ), purchase 4 quart bottles. 12 1 Qt. Bottles. Concentrate. Dilute 7:1 for floor preparation. Treats 1200-1728 sq. ft.
1 Qt. Bottle. Concentrate. Dilute 7:1 for floor preparation. Treats 100-144 sq. ft.